How Far Is Trump Willing to Go to Change Iran’s Behavior? I think it’s probably fair to say that the response from the majority of Iran experts was a collective, “Yeah, right, when hell freezes over.” They’ve certainly got a point. As legitimate as Pompeo’s demands may be, it’s close to impossible to imagine the Iranian theocracy ever willingly complying with many if not most of them. It runs absolutely counter to everything we’ve come to understand about the Islamic Republic’s revolutionary DNA and core ideology. This was effectively a call for the regime’s capitulation, a demand that it tap out and put Qassem Suleimani and his Quds Force out of business for good. In essence, it’s a demand that Iran cease being the Islamic Republic and become something radically different instead — a normal nation. I honestly don’t know what the Trump administration’s ultimate objective is here. Is it just trying to coerce Iran into scaling back its malign activities? Does it believe the regime can be forced to sue for peace on U.S. terms in new negotiations? Or is the unspoken purpose in fact the cratering of the theocracy? Of course, it might be all of these things in some order of preference. That is: at minimum, to work to compel Iran to pull in its horns and reduce its current threat to U.S. interests and, if possible, force Iran back to the negotiating table and get it to agree to a grand bargain that comprehensively addresses its most threatening behaviors, both nuclear and nonnuclear. But if Iran won’t deal, the United States would need to be prepared to keep ratcheting up the pressure until the regime cracked and a popular uprising toppled it and brought forth a more benign successor. One good reason not to dismiss out of hand the administration’s genuine interest in a new deal is simply the fact that we’re talking about Trump here. He’s all about making deals. That’s his DNA. Go in setting forth maximalist, over-the-top demands and scale back as necessary once the other side satisfies your core needs. Then declare victory and market the hell out of the thing. In his own statement upon withdrawing from the Iran deal, Trump made clear that he stands “ready, willing, and able” to make a “new and lasting deal” with Iran’s current leadership. Is that some sort of clever subterfuge? I’m skeptical. Say what you will about the personal views of Pompeo or National Security Advisor John Bolton, but I just don’t see the evidence that Trump, when push comes to shove, has much truck with the regime change crowd. He has contempt for recent U.S. efforts in Afghanistan, Iraq, and Libya. He sees the Middle East as a tar baby, a bottomless black hole sucking up U.S. lives and resources. His overwhelming inclination seems to be to limit U.S. exposure, retrench, and get local allies to step up and carry the burden. Where does a long, risky, resource-intensive strategy to midwife a transformation of the Iranian regime fit into that general scheme? Further strengthening the credibility of the administration’s openness to a new deal was the distance Pompeo went in laying out the benefits that Iran stood to gain from a serious effort to address U.S. concerns. An end to U.S. sanctions. The restoration of full diplomatic and commercial relations. Access to advanced technology and U.S. support for Iran’s economic modernization and reintegration into the global economy. Pompeo didn’t have to go that far — further, I think, than any previous administration has gone. All this had echoes of recent efforts by both Trump and Pompeo (as well as former Secretary of State Rex Tillerson) to go out of their way to reassure North Korea’s despotic leader, Kim Jong Un, that addressing U.S. demands on denuclearization could bring his country unprecedented prosperity and security, as well as a near-explicit assurance of regime survival. Whether it has much chance of actually working in either the North Korean or Iranian context is another matter. But my guess is that this is the model that Trump most likely has in mind as his preferred end state in both cases. Whether the administration is ultimately seeking radical behavior change on Iran’s part or regime change, no one can dispute the sheer audacity — or desirability — of the objectives Pompeo set out. But on the critical question of what means Trump is prepared to devote to this daunting task, serious doubts persist. It’s clear that the White House intends to accomplish a huge amount of the work of squeezing the regime through “unprecedented financial pressure” and what Pompeo called “the strongest sanctions in history.” This sounds extremely threatening — especially for an Iranian regime already on the verge of economic free fall and confronting an increasingly angry and disillusioned populace. 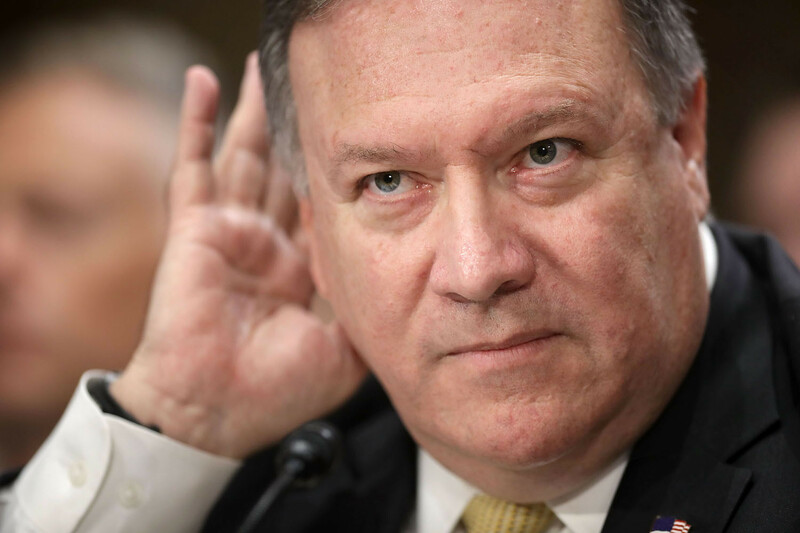 But can the Trump administration deliver on Pompeo’s promise? Some analysts are convinced that the overwhelming power of the U.S. financial system will, in time, bring to heel any effort by recalcitrant and resentful European countries, Russia, China, India and others to resist or circumvent a new U.S. sanctions regime. Others argue no less forcefully that Trump’s blunt force unilateralism and seeming disregard for the strategic interests of the world’s other great powers will, inevitably, result in a not insignificant amount of sanctions leakage. In this view, Pompeo’s notion of re-establishing the coercive power of the pre-nuclear deal sanctions regime, much less the harshest sanctions in history, is fantastical, a pipe dream, with potentially devastating unintended consequences for U.S. global leadership. Watching who has the better of this important debate will be fascinating as an analytical matter. But as a policy matter, it’s safe to say that the Trump administration has much — indeed, the bulk of its Iran strategy — riding on the first group being right. Beyond sanctions, the continued lack of any detail from the administration on how it hopes to employ other instruments of U.S. power to wage a true maximum pressure campaign against Iran is troubling. It’s been a persistent problem since Trump first set forth his comprehensive Iran strategy more than seven months ago. In this regard, Pompeo’s speech did little to move the conversation forward. The questions largely remain: What besides sanctions is Trump prepared to do to achieve the ambitious goals that he has set out? What resources is he prepared to commit? How many allies have been enlisted, and what burdens have they agreed to bear? Here, the fact that there remains a huge question mark over the critical issue of whether U.S. forces will remain in Syria to help constrain and disrupt the Iranian land bridge to Israel’s border is inexplicable. It exudes a lack of strategic seriousness. Pompeo’s speech went on at considerable length about Iran’s escalating aggression across the region and the Trump administration’s determination to end it. But he had nothing to say of real substance on how that will be accomplished on the ground — save for starving the IRGC of funds.